We just thought we’d share a good laugh with you. 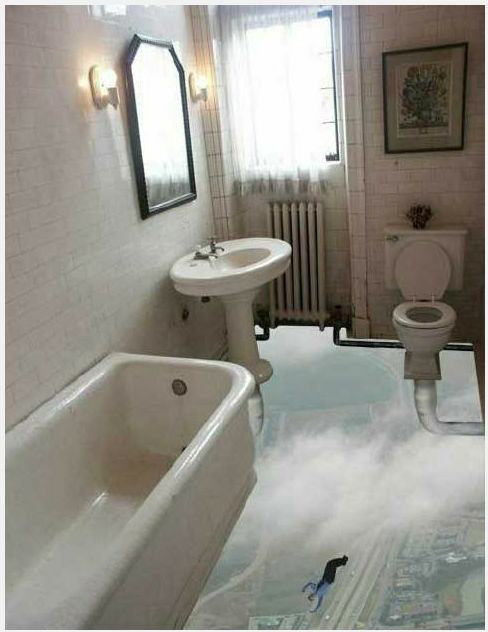 There’s a photo going around in social media and email about a bathroom with a painted floor. It’s actually a printed work by a Photoshop artist called Harry122. The title of the work is Big Step. Printed or painted, the result is still jaw dropping. After looking at the utilities, though, we have to say that the bathroom is in dire need of a makeover. It could well do with one of our modern bathtubs, toilet and a nice single sink vanity and cabinet set.